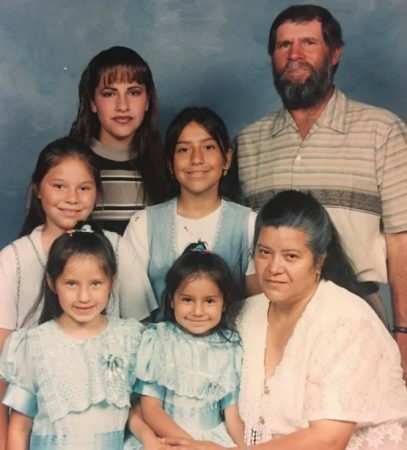 Parents Rafael and Liduvina stand on each side of their five daughters, from left: Maria Sofia, Guadalupe, Luz, Leticia and Karina. Luz Corona Gomez never forgot what her mother advised her sisters and her 20 years ago, as they crouched in the dust to help their parents pick grapes from the sweltering farm fields of the San Joaquin Valley. “She said, ‘You have to get an education, so you don’t work in the dirt like us,’ ” Luz, now 30, recently told the Fresno Bee in a story syndicated by 50 news outlets and shared more than 500 times on social media. Now young women, the sisters never forgot their mother’s words. 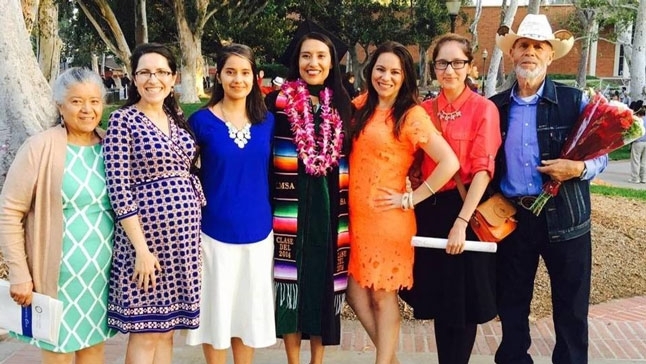 All of them hold college degrees, and their extended family recently gathered to celebrate Luz’s graduation from the David Geffen School of Medicine at UCLA. Their parents, Rafael Corona Villagomez and Liduvina Gomez de Corona, crossed the U.S.-Mexican border in 1982 to ensure their future children had the educations they never received. They settled in the small town of Selma, found jobs as farm laborers and instilled in their five daughters the importance of helping others. From early childhood, the girls toiled beside their parents every summer break to help the family earn income. The grueling work began before dawn and lasted all day, every day, for only 17 cents per bucket of grapes. Luz’s passion for medicine arose out of her family’s personal experience. She never forgot the mistreatment and injustices she witnessed in the farm fields in the 1990s, when employers were not required to provide workers with portable toilets or shade from the broiling sun. While at UCLA, Luz was recognized by the American Medical Association and Gold Humanism Honor Society for her tutoring and volunteer outreach to minorities and the underserved. After completing a residency in obstetrics and gynecology, she aims to return to the central San Joaquin Valley to do public health work and serve as a role model for other low-income and Mexican-American children. Her sisters share her philosophy. Each is working hard in her profession to guarantee equal rights for people often denied a voice. Maria Sofia, 33, earned her J.D. from UC Berkeley and is an attorney at the Immigrant Defenders Law Center in Los Angeles. Leticia, 28, holds a master’s in international relations from UC San Diego. She is the community advocacy director for Leadership Counsel for Justice and Accountability, a Fresno non-profit. Karina, 26, graduated from UC Berkeley and is applying to medical school. She works as a STEM tutor for disadvantaged high-school students attending the Doctors Academy, a program of UC San Francisco’s Latino Center for Medical Education and Research in Fresno. Guadalupe, 23, graduated from UCLA and is choosing between a career in medicine or law. The Corona Gomez daughters’ drive to contribute and make America better flies in the face of current political rhetoric describing undocumented immigrants as criminals and an economic drain on society.